Apart from singing in the shower and singing along with the radio when no-one could hear me, I never knew I had a voice. Back in 2009, during some time off work, I had a few singing lessons for something different to do and it was only then that I discovered I could actually sing a bit. And I haven’t looked back since! Growing up, I remember listening to my transistor radio (it was a 13th birthday present) and playing records on my sister’s phonogram, such as musicals, artists like Robert Goulet (singing Panis Angelicus!) and other popular music from the 1950s and ’60s. I would sing along when no-one was around, holding anything that looked remotely like a microphone in my hand – until a grown-up would appear and tell me to ‘be quiet and stop that racket’. I think this is a familiar story for a lot of people and in complete contrast to others who grew up surrounded by music in the family. How I envy those people! But at least I’ve now discovered that I can do it, too. As the teen years came along I got more interested in pop music of the ’60s and every month or so would buy a song book put out, I think, by the record companies or radio stations. These booklets had words of all the chart-topping songs for that month. Some of my favourite artists were the Easybeats, the Hollies, Herman’s Hermits, and the Monkees, to name just a few of the many groups from that era. During the ’70s my musical tastes changed with the times, helped along by association with musos and friends who were always listening to music. The odd joint every now and then enhanced the musical appreciation, I’m sure! We were all very much into Steely Dan, Little Feat, Neil Young, Galapagos Duck, Richard Clapton, John Martyn and many, many others. Interestingly, I never had any inclination to sing although many of my friends were in bands (oh, what opportunity missed!). But I was probably still harbouring an ingrained sense of embarrassment about such exhibitionism engendered during childhood. Listening was much safer. In the meantime my older brother Christopher had taught himself guitar, banjo, autoharp and probably other instruments, and played for a while in the ’60s with a folk group. I don’t recall hearing him sing back then, but he certainly does now. In 2015 I visited him in Armidale where he now lives and we sang Messiah with the Armidale Music Foundation, with Paul Holley from Brisbane conducting. What a wonderful experience with a brilliant conductor! Christopher’s most recent musical achievement is learning the cello, along with his choral activity. For a long time I thought he was the only one in the family with a musical gene, but now I know that isn’t so. I came to Canberra in 1992 to take up a job with the public service after five years at uni in Townsville. I grew up in Sydney, and have lived for periods in Perth, Bunbury and Roebourne in WA, then Ravenshoe and Townsville in North Queensland. But I can say without doubt that Canberra is my favourite place. I have met some wonderful people here, including my partner Simon, and lots of like-minded singing friends. 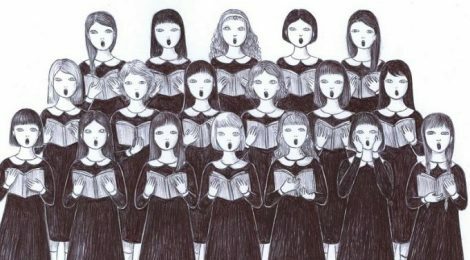 I joined the Dante choir out of the blue – and much to my surprise! Rod Fenwick, our primo guitarist, encouraged me to join when we met up one day at a gig and I recognised him from the agency where we both worked at the time. He said I should come along. I said I don’t speak Italian. He said that doesn’t matter, a lot of the choir members don’t, either. I thought, well why not give it a go. And the rest is history! I just love singing with the choir, and the Italian songs which, surprisingly, are not that hard to pick up, and of course the people who make it such a great experience. I plan to keep singing as long as I can – there is much time to make up for all those missed years. I’ve been with Sing Australia since 2012 and Dante Musica Viva since 2013, and recently joined the PalCare Singers, a group of palliative care volunteers who also enjoy singing. I’ve even done a bit of busking with Yvette, Rod and Matthew at the recent Multicultural Festival – something I never thought I’d have the courage to do. So, I’m invoking my own mantra: Do what you can while you can – you’re a long time dead!